JANUARY 29, 2019 • Stay Connected! What happens in a Form 22A situation where the loan has been declined after proper application has been made and the Buyer wants to apply for a new loan to hopefully close within the contract terms. Does the Buyer need to give notice about the declination and does the Buyer need the Seller's prior approval to apply for a new loan at this point in order to not waive their 22A protection? Buyer needs to get the required, Form 22A, paragraph 5 letter from buyer's lender that declined the loan. The letter needs to satisfy all the requirements for return of the EM to buyer. So long as buyer has that letter, buyer is entitled to recovery of the EM. If there is additional time remaining before the closing date and buyer can attempt to obtain a loan from another lender, buyer is free to do that. Buyer has already satisfied the requirements of the Financing Contingency and is entitled to recovery of the EM. If seller and listing broker do not utilize the benefits of Form 22A, paragraphs 2 and 3, to stay abreast of buyer's efforts and deliver a timely Notice of Right to Terminate, that is seller's and listing broker's decision. So far, this is the easy part of this answer. Whether buyer's broker must disclose the first loan declination is a question of fact that every broker must consider for him/herself on a case by case basis. Broker should seek the advice of his managing broker in thinking through this issue. Issues to consider include: Is the loan declination a Material Fact? Is the question of "Material Fact" impacted by the likelihood of buyer getting financing in the time remaining prior to closing? Why was the first loan application declined? What is the prognosis from the new lender? If the loan declination is a material fact, is it readily ascertainable by seller in light of the privileges extended to seller through Form 22A, paragraph 2? Does buyer broker have a duty to disclose information to seller that seller could discover if seller exercised the rights given to seller by the terms of the Financing Contingency? 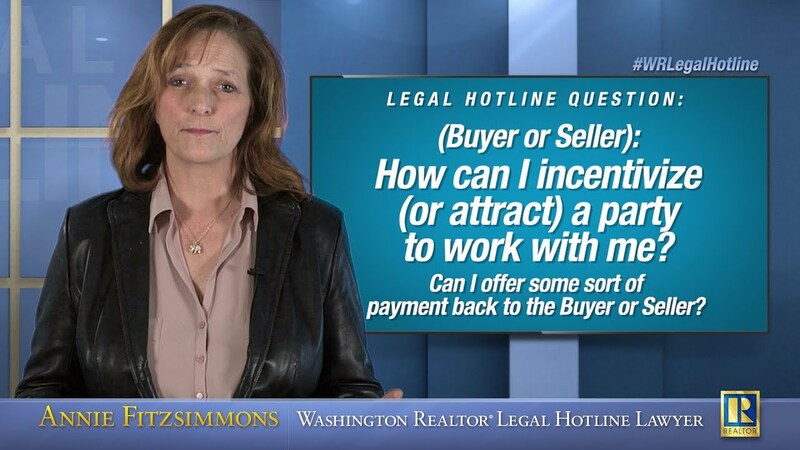 How is all of this impacted by buyer broker's duty of loyalty to buyer, a duty that prohibits broker from taking any action that is adverse or detrimental to buyer's interests in the transaction? There is not a one-size-fits-all answer to any of these questions that broker and managing broker must consider. If broker and managing broker cannot determine their disclosure obligations in this situation, they should consult legal counsel. The competing interests involved in this analysis can be difficult to reconcile and the consequences of making the wrong determination can be significant. (HousingWire) Millions of sensitive mortgage documents [including consumers’ social security number and date of birth] were left exposed on the internet for two weeks in a massive data breach that could affect an unknown number of people. (REALTOR® Mag) National Association of REALTORS® Senior Vice President of Government Affairs Shannon McGahn said a deal reached between President Donald Trump and congressional leaders to reopen the federal government for 21 days while they negotiate a long-term funding agreement is a welcomed development. “Although the direct impact on real estate markets has so far been limited, the broader economic impacts of the shutdown, if it persists, will be very damaging to real estate transactions of all kinds,” said McGahn. Not only do NAR Leadership Academy participants have the opportunity to learn from industry leaders through a combination of in-person events and online learning, but according to previous graduates, they walk away with lasting friendships. The experience will begin in January 2020 and culminate with graduation at the 2020 REALTORS® Conference and Expo in New Orleans, Louisiana. Sign up! Registration is now open. (Anita Clark - YPN Lounge) Real estate is a competitive industry, which means that finding some way to set yourself apart from your fellow agents can occasionally feel like a lost cause. But you don’t need to completely reinvent the wheel. Often, effective real estate promotion is just a matter of putting a unique spin on a tried-and-true technique. Just a small change can return major results.